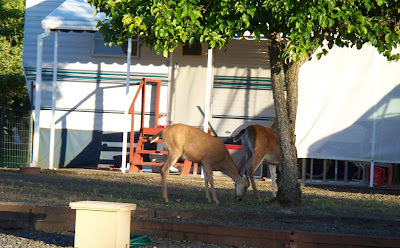 It was nearing the end of August 2007 and we were at Timber Valley RV Park in Sutherlin, OR. Our plan was to stay here about ten days, then go to the San Francisco area to see our oldest son, AJ. There was a sweet smell in the air. We assumed it was from some of the flowers or plants in the area. We asked several locals and they did not know what we were talking about. I guess they were all used to it. We drove all over the countryside smelling flowers and flowery trees and shrubs, but never found the source. Arlon standing beside our Alfa motorhome parked at Timber Valley. This photo give you an idea of the elevation of the roads in the RV park. Tuesday, August 29th we drove through a local coffee shop in a strip mall parking lot and got Kathi a mocha latte – it was not Starbucks's quality, but it would do to get us through our weekly visit to the laundromat. I had regular coffee and it was too strong for me. I added a little water. Temperature was in the low 80’s. We spent the rest of the day home reading and relaxing. We liked opening the windows and watching for animals. There were a lot of deer, jack rabbits, turkeys and colorful birds to watch in the RV park. Deer captured posing in a subsequent visit to Timber Valley. 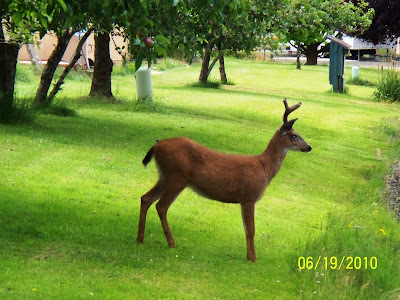 Deer grazing by the door of this fifth wheel. 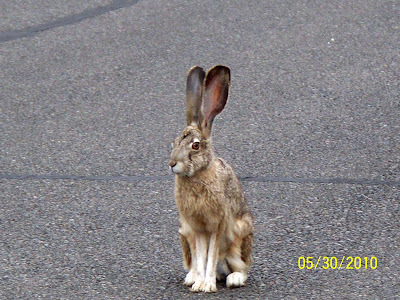 Rabbit sitting on a road inside the RV Park. We stop at Sutherlin almost every year on the way to the Oregon coast. The next day Kathi decided it was time to wash the motorhome. They would not let us use the water, but they have some local people that were allowed to come into the park and wash RV’s. Permanent residents in the park were allowed to wash their motorhomes once per month. After washing was complete Kathi arranged for them to return on Saturday to wax the motorhome. My sister Carol and her husband Lloyd moved into the park on Thursday. They were coming inland from the Oregon coast and it was much warmer here than where they had been. We went to lunch and caught up on the latest from family. Friday, Kathi and I took a walk in the park in the morning. We both did fine going on level ground or downhill, but going uphill was hard for both of us. A little after noon we met up with Carol and Lloyd and the four of us drove into Roseburg to have lunch at Applebee’s. Roseburg was about 20 miles south on I-5. There are very few restaurants or stores in Sutherlin, being a town of less than 8,000 people. Roseburg was the big city with over 20,000 population. They even had a Walmart store in Roseburg. When I got home, I had an e-mail waiting that told me my new computer had shipped. It was nice and cool Saturday morning, so Kathi and I took another walk around the neighborhood. We saw deer and squirrels. It was September 1st and getting cooler. The cool breeze felt cold, if we were standing in the shade. We met Carol and Lloyd for a Mexican food lunch at a small café in Sutherlin. The food was filling, but mediocre to the taste. The conversation is always good. We are all amazed at the details Lloyd remembers about places he has visited. Talking about our travels makes for fun conversations.